I would like to make my intervention on paragraph 199 of the Instrumentum Laboris. In particular, I would like to speak about the conversion implicit in the passage from “pastoral care for young people” to “pastoral care and evangelizing mission with young people”. Much of what I had intended to say has already been said in the interventions yesterday. So, I will try to briefly emphasize the more important points. This passage from pastoral care for, to pastoral care with young people is a process of growth and conversion which mutually engages both the adult pastoral ministers and the young people – not only the conversion of the young people, but also the conversion of the adult ministers – Bishops, priests, Sisters, Brothers, pastoral ministers. From being the objects of pastoral care, the young people become the agents of mission and evangelization, together with the adult ministers – Bishops, priests, brothers, Sisters, lay ministers. The first step begins with closeness to and effective pastoral care for young people – rooted in the reality and the values treated in the first three chapters of Part III: closeness to youth where they are found today, listening to their questions and concerns, welcoming, recognizing, and interpreting this experience through the lens of the Gospel. The second step requires structures for pastoral care at the parish, Diocesan, and international level which create forums for dialogue, discernment and decision-making together – youth, young adults, pastoral ministers, and the community. These Structures include Youth Councils, and forums like the pre-Synod Meeting which trust that the Spirit is moving in the lives and experiences of the young people as well as the adults. These forums must provide the opportunity for frank discussion, where the young adults can face their real questions. International meetings and structures introduce to one another young people and adults from different cultural contexts. This can stimulate creative and imaginative thinking so necessary in today’s world. Through this dialogue, the community can discern concrete initiatives in which all become co-responsible. The third step moves from dialogue to action. This must begin with and involve social action and pastoral care with initiatives on behalf of justice, with migrants, and protection of the environment: the works of mercy which the Holy Father describes, directly serving and in solidarity with the poor and marginalized, which is at the heart of the Church’s mission. Young people learn by doing as well as through dialogue. They must be engaged with the evangelizing mission through explicit proclamation of the word, volunteering, and works of justice. Youth are excellent evangelizers of their peers, other young women and men. But they are called to be part of the whole mission of evangelization of the Church – not just ‘youth to youth’, but youth to all. They strengthen initiatives with groups like Caritas International, Habitat for Humanity, and ministry with migrants and refugees. It is essential that the preparation, arrangements and decisions are not only taken by the ‘elders’ but involve the youth as well. First step: listening, welcoming and recognizing youth where they are. Second step: opening spaces and structures for pastoral care, which ensure dialogue, discernment and decision-making involving everyone. Third step: engaging in concrete initiatives for evangelizing activity, not just youth with and for youth, but youth and adults as missionary disciples together. This process requires the creation of structures in parishes, in dioceses, in religious Congregations, and even international networks, to ensure stability and continuity. It also requires investment of money and people who are prepared and committed to this mission. Above all, it requires the interest and commitment of Bishops, Pastors, and Religious Congregations. 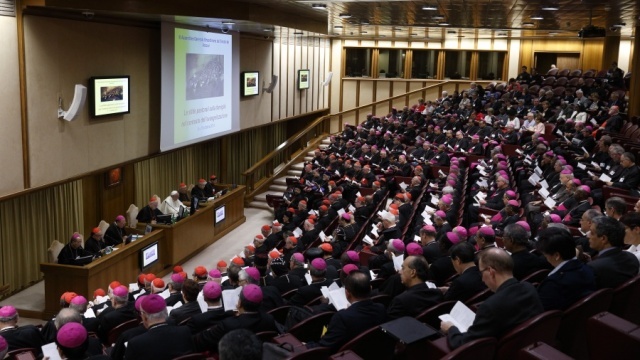 I urge this Synod, especially through the small groups, to make concrete proposals for implementation in every diocese for the evangelizing mission of youth and adults together with the Bishops and Pastors. Young people are excellent evangelizers. Consider how they have evangelized us in this Synod!